Yea, that wasn't very much fun, so I skipped it and did what I loved. I sewed. I made a muslin of the pants one size up and discovered that it fit perfectly with very little adjustment! Talk about getting more from your pattern! If you would like to try this at home I strongly recommend making a muslin first. Once you have it perfected, the muslin will become your new pattern. I usually make my muslins out of interfacing. It's cheap, easy to trace on, easy to mark, and easy to baste together for fittings. Then when your all done, you can just fold it up and put it in the pattern envelope. While your working on the muslin, pay careful attention to the waistband. Next to the crotch seam, which feels the most stress, the waistband is the most important part of the pants. If you think about it children don't have many curves, so that one little strip of fabric has to be entirely responsible for holding the entire garment in place. 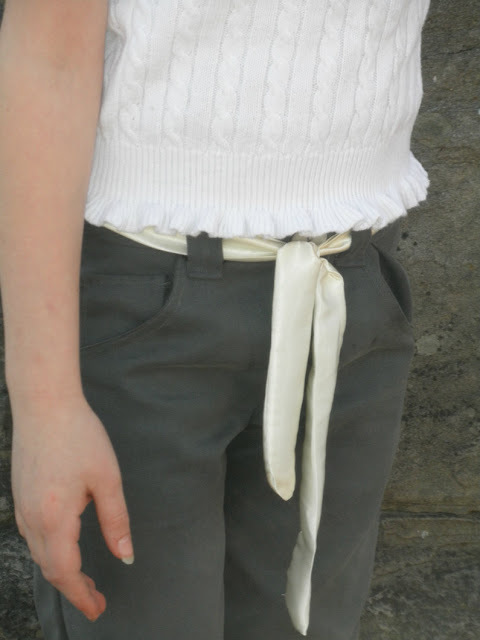 If you don't use the adjustable waistband, make sure to custom fit the band to your child's body. I also used a total of 8 belt loops and made a belt out of some scrap satin for extra support. For the detail (after all that's what this challenge is all about), I wanted to try my hand at appliqueing. The Hello Kitty face was cut off of a pair of pajama pants that didn't fit anyone in the house. First, I machine stitched hello kitty to a piece of woven scrap fabric to stabilize the fleece, and then trimmed closely around the edge. I had to hand stitch the applique to the pants because the cuff barely fit around my free arm. The right way to go about it would have been to applique the pants before sewing them together, but I wasn't sure where I wanted it to go until the last second. I also went over the whiskers with stitches to make them stand out just a little bit more. Since we are talking about details I would love to share some of the unseen details that you can add to just about everything you sew and make you works of art last a little bit longer. Tie all of your thread tails together before trimming them. Anchor your buttons by sewing a few stitches in the fabric before attaching the button. True up all of you woven fabrics before cutting. To do this first pre-wash your fabric then have some one help you pull on it until the grain is straight. You can pull out a single thread to make it easier to see the grain. This pattern also includes instructions and pattern pieces for matching doll pants. Unfortunately the doll pants require a little more work to get them to fit using woven fabric. I will keep working on it for you and let you know when I have it perfect. In the mean time I will be posting about my knit version of these pants very soon, so keep a look out. What are your favorite details, seen and unseen, to include in your sewing? I used the Skinny Jeans Pattern from Peekaboo Patterns to make these pants. The fabric is sueded garbardine. and it feels like silk against your skin. It also has the perfect drape for a pair of dress pants. I love when fabrics look and feel much more expensive then they are! I love that you reused the Hello Kitty appliqué! Those look cute & comfy! Cute! 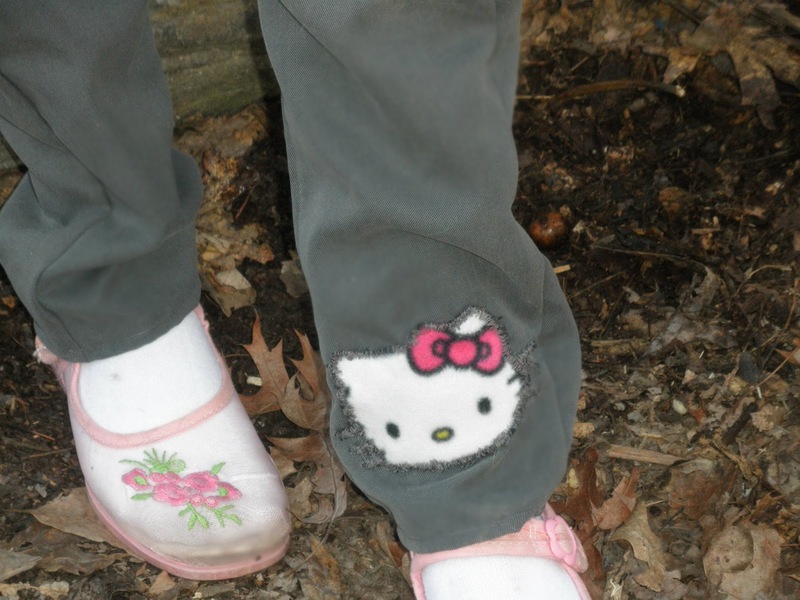 I want to patch some jeans with Hello Kitty patches but haven't figured out how I want do do it yet. Cute pants! 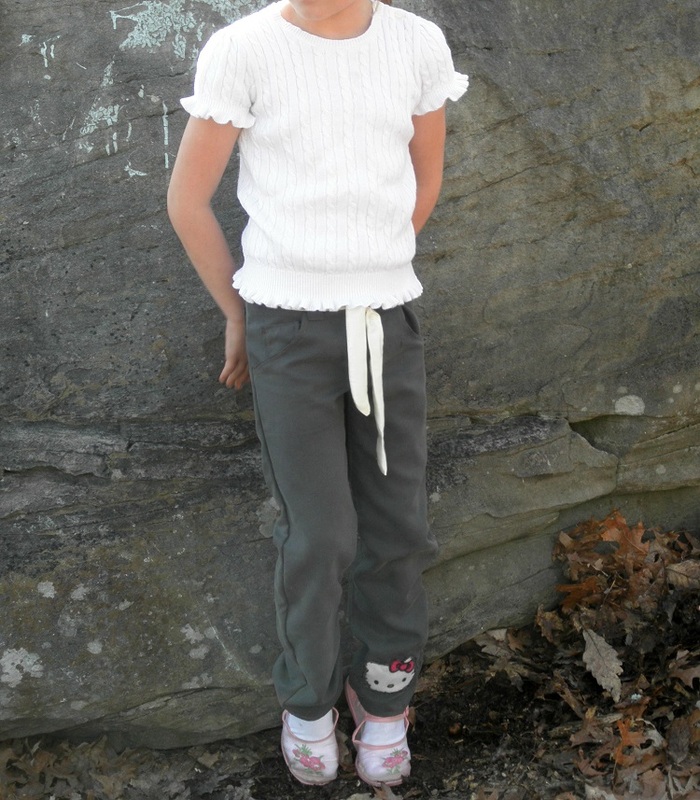 I love the Hello Kitty applique! Those pants look great! I've only made dresses for my girls and a few tops, never pants. I like that you use interfacing to make the muslin. That's a great idea. And I've never heard of Peek-a-Book patterns. Lots of good stuff, looking forward to having some time to really browse the site! This really is the perfect pattern for learning how to make pants. I was a little nervous about making pockets, but after sewing this up I feel like I understand how they work well enough to incorporate it into other projects. That fabric looks so soft and comfortable! Cute pants! !